Last night 1500 people lost their homes due to an uncaring state’s failure to recognise building tensions due to chronic overcrowding. No emergency plan was in place and the people have just a few nights respite in gymnasiums, but then what? Today our amazing team of volunteers, after working ’til 4am last night, were back in the warehouse at 8am this morning to help people who had lost everything. We packed 300 food parcels, 300 emergency bags, loaded a two vans with supplies and distributed them in two of the gymnasiums people were sitting in. We bought gallons of water, gave it out to thirsty people, and spent time chatting to many refugees, letting them know we are still here and we still care. We met over 50 people at the train station and listened to their stories with respect and kindness, we gave them sleeping bags, clothes and food as well as information. We kept them safe from police by sitting on the grass outside the station with them. We gave tens of people lifts to the small camps scattered across Nord du Calais, we bought train tickets and bus tickets for scared travellers. We reassured anxious people we would be here tomorrow and the next day and the days after that, as long as they needed us. We bought hundreds of biscuits and bottles of water for tomorrow, sorted clothes by the tonne for the next few days, checked dozens of tents- just in case. And we ran all our usual daily jobs in and around Calais – Care4Calais volunteers rock! 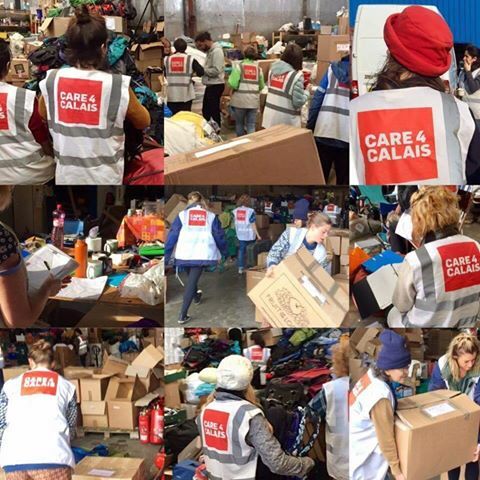 Donate or volunteer @Care4Calais.org to keep people safe and well in the next few days….